Huxley is a brand that combines luxury with gorgeous, sleek minimalism. In addition to being supremely Instagram-worthy, I’ve heard really good things about their products too. I’ve been drooling over their offerings for a while, to be honest, but I was waiting for a good deal to come along. Then one of my favorite KBeauty shops, OHLOLLY Beauty, reached out to me to see if I’d like to review some Huxley products and I couldn’t say yes fast enough! The lovely Sue from OHLOLLY graciously sent me the Huxley Secret of Sahara Cleansing Duo, which includes the “Be Clean, Be Moist” Cleansing Water and Cleansing Gel. It’s worth mentioning too, that Sue specified that I was under no obligation to write a blog post about it — she just wanted feedback about the products (these are my favorite type of press samples…the ones with no strings attached!). I personally love the concept of “Be Clean, Be Moist”, because that’s exactly what I want from a cleansing product. I want it to cleanse my skin really well, while at the same time maintaining the integrity of my skin’s natural moisture barrier. I also love that these two products come in a set, encouraging you to double cleanse with each use. I’ve used the Huxley Cleansing Duo for about a month now, and I even decanted them to bring with me on a trip to Toronto. I normally break out when I travel (especially to a place with high humidity), but I didn’t this time round, which makes me think these products did a good job of keeping my pores unclogged and my skin clean. The first thing that I noticed when I opened up the Huxley Cleansing Water was the scent. It has a rather strong floral scent that refuses to be ignored. At first I thought it was too strong, but after a few uses I grew to enjoy it. From what I hear, Huxley products all have this signature scent, and it seems that people either love it or hate it. It’s a pleasant, high-quality, but very lush floral, which smells almost exactly like you stuck your face into a giant bouquet of blooms. If you’re not into floral scents, you should probably approach this with a smidge of caution. 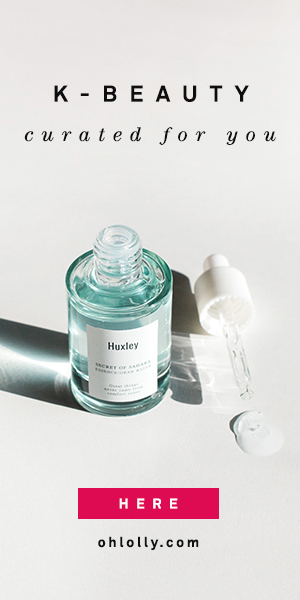 The star ingredient of Huxley’s Secret of Sahara line is prickly-pear cactus extract, and it is the first ingredient in the Huxley Cleansing Water. It also includes prickly-pear oil, as well as hydrating sodium hyaluronate and a variety of other extracts. Although alcohol appears low on the list, I didn’t notice any alcohol scent or any dryness or irritation, so the amount must be very small. This is, I think, the most moisturizing cleansing water I’ve ever used. I like to “triple cleanse” sometimes, which means I like to wipe off my makeup when I get home, and then double cleanse later in the evening. With the Huxley cleansing water, I was able to simply wipe my face, and my skin would feel soft and moisturized up until I cleansed it at night, with no other products used. I do feel that there is a bit of product left sitting on my skin after using the cleansing water, but rather than feeling sticky, it feels just nicely moisturizing, as if I’d just used a really nice serum or oil essence. This residue might turn some people off, however, especially if you don’t follow up with a foaming cleanser. Sometimes I use the Huxley cleansing water as the first cleanse at night to remove sunscreen before following up with the gel cleanser, and it seems to do a great job removing all traces of sunscreen without drying out my skin. And I’ve even used it in a pinch to remove my makeup at night instead of an oil cleanser, and I haven’t experienced any clogged pores as a result, so it seems to remove makeup well. The Huxley cleansing gel has the same floral scent as the cleansing water. It claims to be a low-pH, moisturizing cleanser. The texture is of a runny clear gel, which lathers up beautifully into a rich foam. After using the cleansing gel consistently for a month, I can definitely say that it is gentle and did not strip my skin. I never got that squeaky clean feeling that I sometimes get with other cleansers. It did make my skin feel very slick as I massaged it in, and it took maybe more rinsing to get that slick feeling off than some of my other cleansers, but it was nothing I couldn’t deal with. I wouldn’t say it was exactly moisturizing, as all the rinsing afterwards negated any moisturizing effect, but it certainly wasn’t drying. I tested the pH of the cleanser and it came to somewhere between pH 5 and 6, which is great. Sometimes I would use just this cleanser without double cleansing if I had only worn sunscreen that day, and it seemed to do a good job getting my face clean — no clogged pores. In general, though, because this is such a gentle cleanser, I’d recommend removing makeup first with the cleansing water or an oil cleanser. I really enjoyed the Huxley Secret of Sahara Cleansing Duo, and I think both products did what they claim – cleanse well while maintaining moisture. As I mentioned, I brought these with me on a trip to the humid Toronto summer. Usually my skin freaks out with the climate change from super dry Southern California to humid weather, but I didn’t have any pore clogging or breakouts during this trip, which I attribute to proper cleansing and moisturizing. I think all skin types will enjoy these products, although people with oilier skin may want to rinse off the residue after using the cleansing water (people with drier skin will probably appreciate it). And I think that the strong floral scent will put some people off, though I personally love it. These products were generously provided free for review by Ohlolly. All reviews are, as always, my honest opinion. This page may include affiliate links. Really like the sound of both products, and the cleansing water actually reminds me a bit of the Bioderma Hydrabio Micellar water, but with a lot more hydrating ingredients, plus the scent sounds amazing! Hm I haven’t tried the Hydrabio but I have tried (and loved) the Sensibio. This leaves a bit more of a residue on your face, but in a good way, I think. The scent is a love/hate thing for some people. I’ve meet a few who don’t care for it and others who love it! Awesome! Huxley is everywhere these days! I find the scent really addictive as well! But I can see that it might be a little strong for some =p! I’ve heard great things about the toner, will have to try it!